If baseball doesn't work out for him, Willie Calhoun might want to consider a career in fortune-telling. A night after he predicted he'd hit a home run, the Dodgers' No. 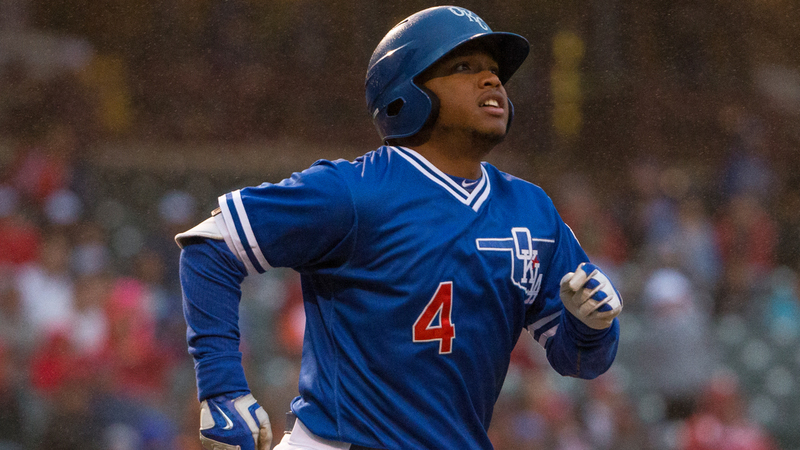 3 prospect called the first of three straight first-inning blasts, then hit the third one as Triple-A Oklahoma City doubled up Round Rock, 12-6, on Friday at Chickasaw Bricktown Ballpark. "Before the game started, [rehabbing Dodgers outfielder Joc Pederson] was in the clubhouse talking to me and was like, 'Dang, you're about to hit a homer tonight,'" Calhoun recalled. "I was like, 'You are too.' And then he hit it and I was like, 'I told you.'" With the Dodgers trailing, 3-0, Pederson started their comeback with a solo shot on the first pitch he saw since being placed on the Major League concussion disabled list on May 23. "He's a monster. He's an absolute stud," Calhoun said. "The power he has is just unreal. His first swing back after not seeing a pitch in I don't know however long he's been out, that's just unreal. The first pitch he's seeing, he's just able to hit a ball to left-center like that -- and the ball doesn't really go to center field in OKC like that. When he hit that ball, I was like, 'Man, you have some major power.' He looked really good. "Then Slykey hit his and that made me want to hit one really bad." Scott Van Slyke followed by crushing a shot to left to set the stage for Calhoun, who had never been part of back-to-back-to-back homers. "My adrenaline was going after I saw two home runs in a row. I was like, 'Oh, I really want to hit one now,'" he said. "It happened the first pitch. I was able to see a pitch up by Tyson Ross and was able to put a good swing on it." Calhoun sent his 12th homer of the year out to right-center to draw the Dodgers even. The three blasts came on a total of five pitches, the first time that's happened since Oklahoma City joined the Pacific Coast League in 1998, according to Dodgers broadcaster Alex Freedman. When he got back to the dugout, Calhoun and Pederson shared a chuckle. "Joc was sitting there laughing," MLB.com's No. 71 overall prospect said. "He had a big smile on his face and was like, 'I told you.' I laughed and just said, 'Yeah, you were right.' It was just good to have that adrenaline going up there for that AB." The Dodgers plated two runs in every inning from the fourth through the seventh to pull away. Oklahoma City piled up 15 hits, including four from Drew Maggi out of the ninth spot in the lineup. He doubled twice and drove in four runs. "It really relaxes me because 1-9 is ridiculous on our team," Calhoun said. "Our team, I think we have one of the better lineups. I'd put our lineup up there with any team in Minor League baseball. Seeing all the people around me do so well, it's really good. It takes the pressure off so I can go up there and relax and just have a good time in the box." Calhoun has cooled a bit in June, batting .262 compared with averages of .320 in April and .286 in May, but he's got his eye on the bigger picture at this stage of the season. "Being consistent and making sure you have fun with baseball, I still think that's key," he said. "I think that's where some of my success comes from. I just come to the ballpark and try to have a good time the whole time. I never let anything get too serious or anything. I always have a smile on my face, and that's what I think I've been doing all year. It's really helped me out a lot." Pederson grounded into a force play in the second and flied to left in the fourth, exiting in the sixth for defensive replacement Trayce Thompson.